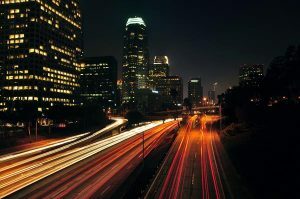 It’s not just you: the drive home really is longer in L.A.
USC research shows it’s often faster to get to work in the morning than it is to get home at night. Your evening commute? It’s probably a lot longer than your morning drive, even though it’s essentially the same trip in reverse. Crosstown, a research project between USC’s Annenberg School for Communication and Journalism and the USC Viterbi School of Engineering, examined 18 of Los Angeles’s busiest freeways over a full year. Morning commutes were faster almost 80 percent of the time in 2017, based on average speed in each direction. Crosstown is an ongoing research project that mines data on key quality of life indicators in Los Angeles, such as traffic, crime and air quality. The project is an effort between Cyrus Shahabi of USC Viterbi Integrated Media Systems Center, Yao-Yi Chiang of USC Dornsife Spatial Sciences Institute, and Gabriel Kahn of the USC the Annenberg School of Journalism. There are multiple factors that make evening commutes longer. According to experts at both CalTrans and LA Metro, perhaps the biggest impact is that morning commuters go straight to work or school. In the evening, people often run errands or go to dinner, staying on the road and clogging lanes. If you’ve driven in Los Angeles, you’ve likely contributed to this analysis. The numbers come from the Archived Data Management System, which stores millions of signals every hour as it records the flow of traffic across the county. Most of the inputs come from thousands of inductive-loop traffic detectors deployed across the county. You know them as the black circles embedded in the blacktop and on freeways. In order to process all this data, USC Viterbi’s Integrated Media Systems Center builtTransdec, which can process massive amounts of GPS trajectories to analyze a variety of performance metrics. Transdec is funded by funded by LA Metro and the USC Metrans Transportation Center. Funding for Crosstown was provided by the Annenberg Foundation.